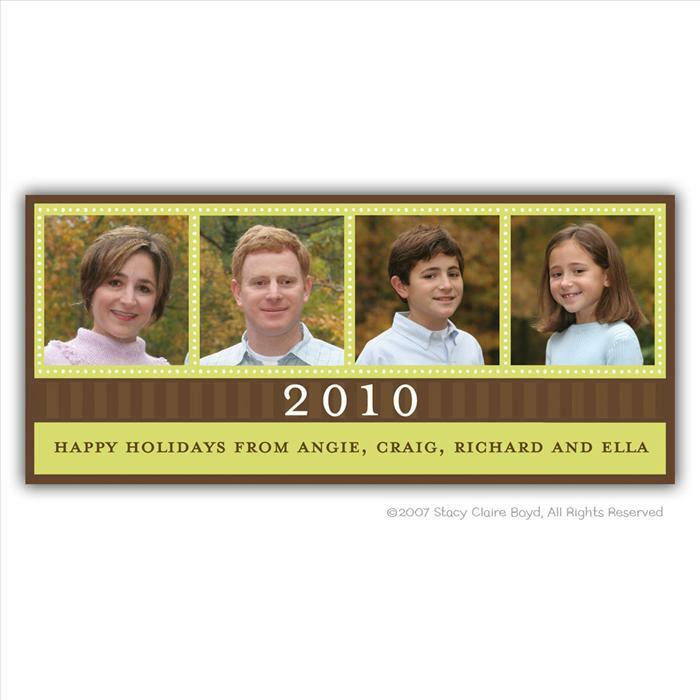 Description: Say "Happy Holidays" with this All In the Family "Imagitation" photo card. The design features four separate photo boxes, each with an olive green border with white dots, beneath is an oxford stripe chocolate band and another in olive green for your holiday message. An "Imagitation" is an image from a personal photo that is incorporated onto the card during the printing process. Card measures 4.75" x 9". Price includes up to 8 lines of text (extra lines are $5.00) E-mail your picture and message. You will see a proof before printing. Matching return address sticky or printed return address is available.